IMI shipped two flavors of the semi automatic UZI carbine to the United States - the Model A and the Model B. The difference between the two are slight and people often ask how to tell them apart. With one of each in hand, I did a side by side comparison. Here are the results. The surest way to tell which model you're looking at is by reading the fine print. The left side of the receiver, under the rear sight, will be stamped either Model A or Model B. Probably the most talked about difference between the two models is the sights. The Model A shipped with the sights originally designed for the UZI SMG. The Model B shipped with sights that were designed for the newer Mini UZI. The front sight of the Model A is adjustable for windage and elevation. The front sight on the Model B is only adjustable for elevation. A different sight adjustment tool is used for each one. 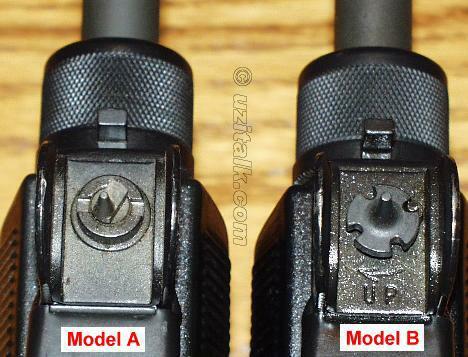 Once of the easiest ways to tell the difference between the A and B at a distance is the rear sight. The Model A has a small size bolt head and nut going through the rear sight. The Model B has a larger bolt head and nut on the sides of the sight. 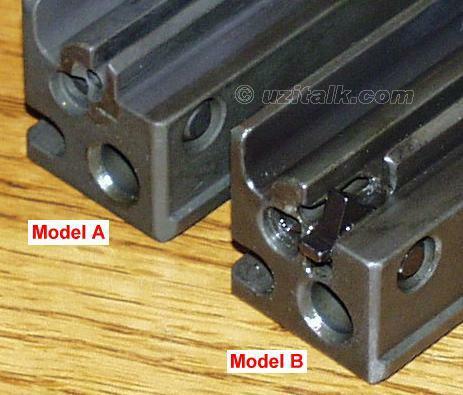 The rear sight of the Model A is not really adjustable at all. The Model A has an L shaped peep sight. One is marked for 100 yeards and one marked for 200 yeards. The distance is selected by flipping the L sight forward or backward. The Model A sight was originally designed for the 10" SMG barrel so it tends to shoot high with the 16" semi barrel. On the Model B, the rear sight is also an L shaped peep sight but it's windage adjustable. The L sight is narrower so it can be adjusted side to side and it's marked 1 and 2 for 100 and 200 yards. 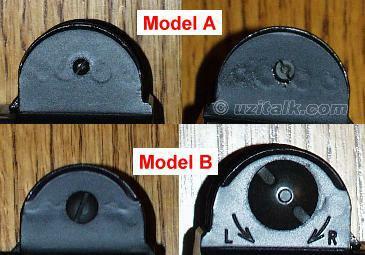 The Model B sight adjustment tool is used on both the front and rear sights. The bolts on the Model A and B are the same with one exception. The Model B has an added safety feature. A spring loaded arm on the back of the bolt prevents the firing pin carrier from coming all the way forward except when the bolt is fully closed, thus preventing the gun from firing out of battery. The ejector pivots this safety arm out of the way when the bolt closes. 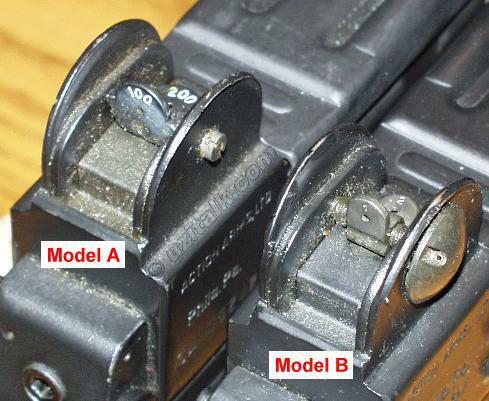 This safety mechanism can be found on all closed bolt UZIs, including the Mini UZI and the UZI Pistol. I've heard that the ejector on the Model B was lower but that did not seem to be the case on the gun I examined. 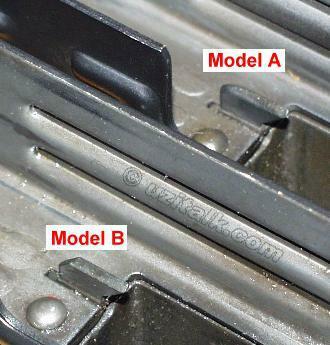 The only difference was that the rear corner of the Model B ejector was cut at an angle. That was done to allow the carrier safety arm (see above) to be lifted smoothly when the bolt closes. Some of the Model A's have a front sling swivel stud that only allows the sling swivel to rotate 90 degrees. The receivers on both the Model A and B have flat spots above the sling swivel stud. Some (but not all) Model A's have a larger stud with two flat spots on it. The flat spots on the stud contact the receiver flat and keep it from rotating more than 90 degrees. In addition to the guns themselves, packaging for the Model A and B was significantly different.